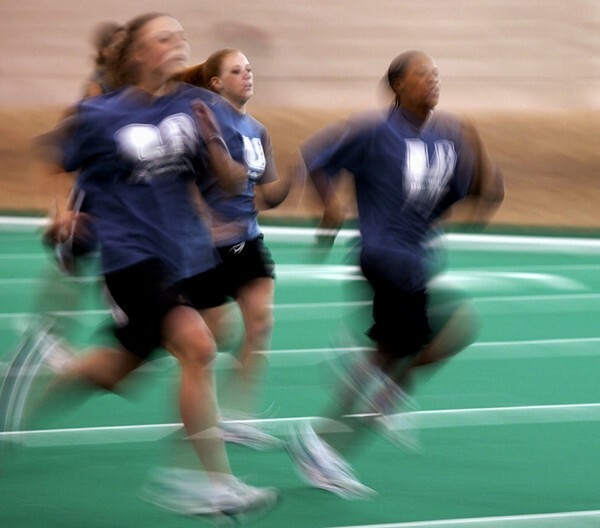 9/26/03 --- UTAH STATE WOMEN'S BASKETBALL TEAM --- LOGAN, UT: Utah State basketball players run sprints during morning conditioning program. Utah State announced it was reinstating women's basketball on March 5, 2003. Utah State dropped women's basketball after the 1987 season and was one of three Division I schools that did not field teams last year along. Photograph by Robert Hanashiro, USA TODAY.